Above: Looting, burning and chaos in West Baltimore this evening on the day of Freddie Gray’s funeral. 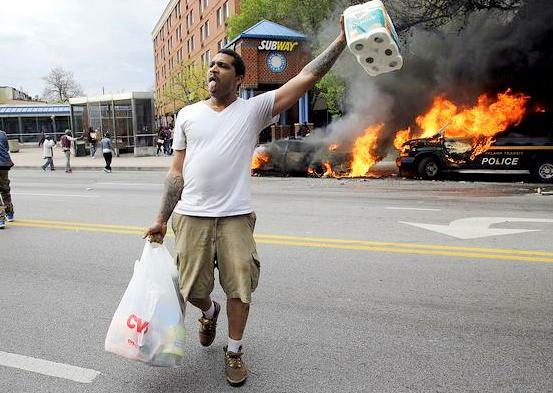 Amid the worst civil disturbance in Baltimore since the 1968 riots, Maryland Gov. Larry Hogan has declared a state of emergency and activated the National Guard who are expected to assist in quelling the widespread violence, arson and looting that has broken out in inner city neighborhoods. Attributing the violence in Baltimore to ”a group of lawless individuals with no regard to safety of that community,” Gov. Larry Hogan signed an executive order declaring a state of emergency. Many people watched Hogan speak on CNN in a split screen. Opposite his image were scenes of chaos – a fire at an East Baltimore mid-rise senior center under construction, people running out of convenience stores with looted items, a group of men stomping on a police car with someone inside trying to drive it away. No deaths or serious injuries have been reported so far, but 15 police officers were injured from rock throwing earlier today. 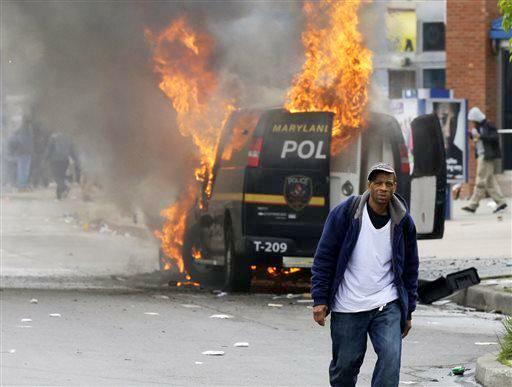 The declaration was requested by Mayor Stephanie Rawlings-Blake five hours after youths attacked police with bricks and bottles at Mondawmin Mall and then rampaged down Auchentoroly Terrace and Pennsylvania Avenue to North Avenue, where police vehicles were burned and stores looted. A reporter asked Hogan why it took so long for the National Guard to be activated and a state of emergency declared. Hogan essentially said the city was slow to request it. Maryland State Police Superintendent William M. Pallozzi said that 500 state troopers will activated and that they have requested the assistance of an additional 5,000 officers from neighboring areas. Linda Singh, head of the National Guard, said soldiers will be out in force, but stressed that “this is not martial law.” She said the Guard will be taking order from the Maryland State Police. Asked who is in charge of making decisions about how law enforcement resources are to be deployed, Hogan said the Maryland State Police. The violence followed eight days of protests demanding answers about the death of 25-year-old Freddie Gray while in police custody. After the peaceful march from West Baltimore and demonstration outside City Hall on Saturday, a group of people moved from City Hall to the Inner Harbor. What followed at Camden Yards and West Baltimore were sporadic bursts of violence – rock-throwing, looting, destruction of police cars and limited property damage around Camden Yards downtown. Gray, who died April 19 of severe spinal chord injuries, has become a flashpoint for years of pent-up anger by black residents about their treatment by Baltimore police. Police have suspended, with pay, six officers involved in the arrest, but have said little about how Gray was injured. A funeral was held this morning for Gray at New Shiloh Baptist Church on North Monroe Street, several blocks from Mondawmin Mall where today’s violence erupted. While clergy and the Gray family urged peace at the funeral, hundreds of people assembled in the streets around the church. Around 2:30-3 p.m., school kids amassed at Mondawmin Mall, where students from nearby Frederick Douglass High School and elsewhere pick up buses and the Metro subway to get home. They reportedly began throwing bricks and rocks at police who, tipped off that there may be a disturbance, had assembled units near Reisterstown Road and Gwynns Falls Parkway. Over the next three hours, as both the mayor and Police Commissioner Antony Batts remained publicly secluded, scores of mostly young people rampaged around the mall, down Liberty Heights and Auchentoroly Terrace and Swann Drive, battling with police, and then continuing south to North Avenue. By the time the mayor requested the National Guard at about 6 p.m., Baltimore police were reporting dozens of outbreaks of looting, mostly along the West North Avenue corridor and North Fulton Street, but including a downtown store at Eutaw and Lexington. A three-alarm fire then broke out at a senior center under construction by the Southern Baptist Church at Chester and Gay streets in East Baltimore, sending flames and black smoke billowing across a community that has suffered decades of blight and abandonment. “This is not a lawless city,” Rawlings-Blake declared at a press conference tonight at the downtown Emergency Operations Center. She lamented “the negative images being shown of this great city” and cast blame on the news media. The same theme was echoed by City Council President Bernard C. “Jack” Young when he stepped before the microphones. “These are thugs seizing upon an opportunity,” he said, and not residents of Sandtown-Winchester or the Gilmor Homes near where Freddie Gray was arrested. Rawlings-Blake announced a curfew between 10 p.m. and 5 a.m., effective tomorrow (Tuesday) and lasting a week. She said only people going to work or suffering from a medical emergency should be on the streets during those hours. Col. Darryl DeSousa, chief of patrol, reported that 15 officers had sustained injuries today. He characterized them as mostly minor, but said two officers sustained major injuries and remained hospitalized. Most of the injuries were caused by “flying debris” from marauding bands of youth. “The Police Department will not stand for that,” DeSousa said of the violence.